Fresh on the heels of the closing of Hollywood Spa another LA bathhouse has apparently shut its doors. 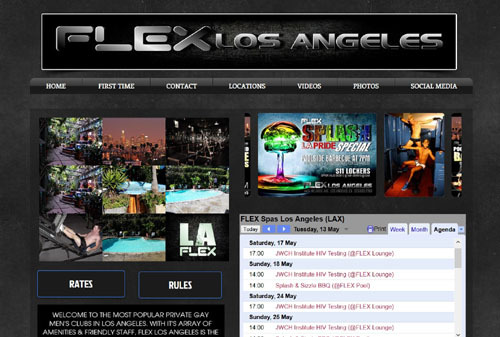 This time the Flex Spa in Los Angeles. Its parking lot has a sign posted simply saying “business closed.” Neither the head office in Cleveland, nor the bathhouse itself has been answering the phones. The closing has caught everyone by surprise. They had just recently undertook a major renovation to the spa. Plus it didn’t seem to lack customers as attendance seemed to be consistently brisk. They were still open as of last week. Flex Spas is part of a chain of bathhouses, with locations in Cleveland, Atlanta, Los Angeles and Phoenix. The Cleveland location was the first Flex bathhouse to be established, and that location became the world’s largest bathhouse. Charles Fleck was its proprietor until he died in 2012. There are still five bathhouses in the Los Angeles area. We will keep you updated to any new developments to this story. UPDATE According to the Flex Spas web site it is only a temporary city permit issue and is expected to be resolved, though no time frame appears to have been given.